The Kestrel or type F is a 700 horsepower (520 kW) class V-12 aircraft engine from Rolls-Royce, their first cast-block engine and the pattern for most of their future piston-engine designs. Used during the interwar period it remains somewhat obscure, although it provided excellent service on a number of British fighters of the era. 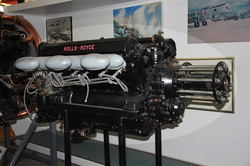 The engine also sold to international air forces, and it was even used to power prototypes of German military aircraft types that were later used during the Battle of Britain.